Disarmament Insight: UN Small Arms Process "Back on Track"
Emmanuel Jal raps about his experiences as a child soldier in Sudan in front of delegates to the 3rd Biennial Meeting of States to consider implementation of the UN Programme of Action on the illicit trade in small arms and light weapons (photo by the author). UN Member States met in New York all last week to examine, as they do every two years, how the 2001 Programme of Action to curb the illicit trade in small arms and light weapons is being implemented. A lot was at stake in this meeting. Guns are used to take the lives of about 300,000 people every year. They injure and disable about three times that number and commit millions more to living in perpetual poverty and fear. As some participating States pointed out, speaking from their own national experience, the uncontrolled proliferation and misuse of guns is a matter of life and death in many parts of the world. The choice, at least, would seem to be a simple one: Give in to pressure from a small minority of States and revert to an approach that has twice proven less than effective. Or, go with what the vast majority of States wants - an effective, focused meeting that stands a much better chance of advancing international efforts to curb the illicit small arms trade and of sketching out a much-needed agenda for future action. The meeting last week was indeed presented with this choice. But not, as I had predicted, at its beginning but at the very end, when Iran forced a vote on the outcome document. The document - substantive, detailed and forward-looking - passed with the overwhelming majority of 134 States in favour, none against and 2 abstentions (Iran and Zimbabwe). The Netherlands Ambassador proclaimed triumphantly - and to loud applause - at the close of the meeting, "The UN Programme of Action on small arms is back on track!" This was a truly remarkable achievement on a number of levels. The two main reforms proposed months before by the Chair - to make international cooperation and assistance and national capacity-building the overarching theme, and to focus the meeting on a small number of other issues (tracing, brokering, and stockpile management and surplus disposal) - worked better than anyone could have anticipated. States largely dispensed with delivering rambling and unfocused national statements, which had taken up so much valuable time at the two previous biennial meetings. Instead, they engaged in much more in-depth, substantive and at times even genuinely interactive debate on the focus issues. Not only that. The substantive discussions were prepared well in advance of the meeting by States designated by the Chair - Egypt, Colombia, the Republic of Korea and Switzerland. Each consulted widely in advance of the meeting and prepared detailed discussion papers that helped, during the meeting, to focus minds on the issues at hand. Nongovernmental experts introduced the discussions with insightful overviews of where the problems lay - also an innovation in these kinds of meetings. Draft text for the outcome document, drawing on the discussions that had taken place, was posted on the meeting's website by 9am every morning (necessitating, it should be acknowledged, some dedicated people working all night). The meeting also broke a number of other diplomatic molds. Music, for example, played an interesting role. 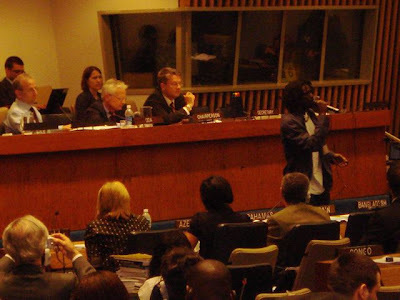 At one point, the Chair invited Emmanuel Jal, an up-and-coming rapper from Sudan, to perform in front of delegates in the plenary hall one of the many songs he has composed reflecting on his experiences as a child soldier (Mr. Jal was abducted when he was six years old and sent to fight with the rebel army in Sudan's civil war). The effect was powerful and brought home, more eloquently than any statement could have, the importance of global efforts to stem the illicit arms trade. Sticking with the musical theme, the Chair - Ambassador Dalius Cekuolis of Lithuania (himself an accomplished musician) - later quoted jazz trumpeter Dizzy Gillespie in an attempt to move participants towards agreement on an outcome document: "When you hit a bum note, don't stay on it too long," he quoted the master as saying and also pointed out that the difference between being in harmony or not can be a matter of raising or lowering the note by a semi-tone (or even, in some Asian music, by a quarter tone). Achieving this harmony turned out, in the end, to be quite tough. By Friday - the last day of the meeting - the Chair had produced a detailed, forward-looking outcome document focusing on the four focus themes as well as a number of other issues that had been raised during the week's discussion. Already before lunch, participating States were ready to allow the Chair bring down the gavel on this document. He would have done so were it not for Iran, who complained about the new way that the meeting had been run and asked instead to have the proposed outcome document annexed to the procedural report of the meeting - something that would have significantly downgraded its status. It was clear, however, that Iran was completely alone in holding this position. Many States in the room tried their best to bring Iran around. Some pleaded, some shouted, some cajoled but none were successful. In the end, the only option remaining to the Chair, aside from caving in to Iran's demand, was to proceed to a vote - a first for the UN small arms process. The Chair proposed a vote by show of hands. Iran requested a recorded vote and so everyone had to traipse up the corridor to another room with the required voting machinery. Before the vote, Iran, clearly displeased, said that it would abstain and cryptically announced that, in retaliation of sorts, it would consider resorting to voting in other issue-areas of disarmament and arms control as well (!). The only surprise of the vote itself was that Zimbabwe joined Iran in abstaining. All other participating States - all 134 of them - voted in favour of adopting the outcome document as an integral part of the meeting's report. In the end, there was consensus on how to move forward with global efforts to curb the illicit trade in small arms and light weapons. It's just that Iran and Zimbabwe chose not to join it. In the end, there was harmony; although two voices chose not to sing. Great stuff Patrick - voting has its place & we should use it when appropriate!